IntentService is a a base class for Service that can be used to handle asynchronous work off the main thread by way of Intent requests on demand. Each intent is added to the IntentService’s queue and handled sequentially. Clients send requests through startService(Intent) calls; the service is started as needed, handles each Intent in turn using a worker thread, and stops itself when it runs out of work. If you need parallel asynchronous processing then you need to look at the AsyncTask Tutorial. AsyncTask is limited to a single execution. Create a class file that extends the IntentService class and add stubs for the methods you need to implement. You should add a constructor with the name of your new service. You will need to implement just one other method called onHandleIntent(). In your Activity start the Service with a call to startService() for an Intent instance. You can pass any data to the intent using the extras. The service takes over from here, catching each intent request, processing it, and shutting itself down when it’s all done. The main user interface remains responsive throughout the processing, allowing the user to continue to interact with the application. 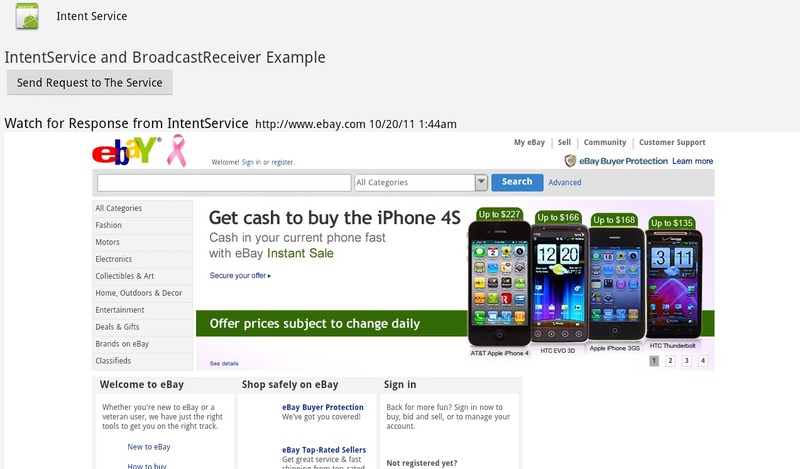 You need to send a broadcast from the onHandleIntent() method of the IntentService class after the processing is complete to let the BroadcastReceiver know results of the process. Define the BroadcastReceiver as subclass within the main activity and register the receiver. In the example below, IntentService class has a delay of 10 seconds added to the processing which you must remove in you real application. This is there to simulate delay in processing heavy duty stuff that you may want to offload from the main activity and display the queue process as I fire three subsequent request. The program makes web requests and loads them in the main activity's WebView. android:layout_height="wrap_content" android:text="IntentService and BroadcastReceiver Example"
<Button android:text="Send Request to The Service" android:id="@+id/sendRequest"
<TextView android:text="Watch for Response from IntentService"